Did you grow up speaking Gaelic and if so, where, and did you get it at school? Where I was brought up, near a wee village called Gartocharn on the border of the Southern Highlands and the central belt; It was English we had in the house, didn’t get a word of it at school! I started speaking Gaelic in my late teens because my family, originating from the West Highlands on both sides, all spoke it and my dad’s family in particular were very famous for being a big part of the Gaelic tradition (singers, pipers, tradition bearers). What or who first got you into music and what was the first instrument you learned? And now what instruments do you play? 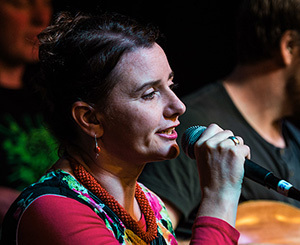 I first got into music through my parents – my father is from a famous hereditary tradition of pipers spanning many generations as is my mother’s (although she doesn’t play herself). I learned the pipes first of all and I’m told I could sing ‘canntaireachd’ before I could talk. The instruments I play now are: highland, small and uileann pipes, electric/acoustic guitar (like playing jazz guitar in particular), whistles, a bit of percussion, mouth organ, and of course the beatmaking/rapping. 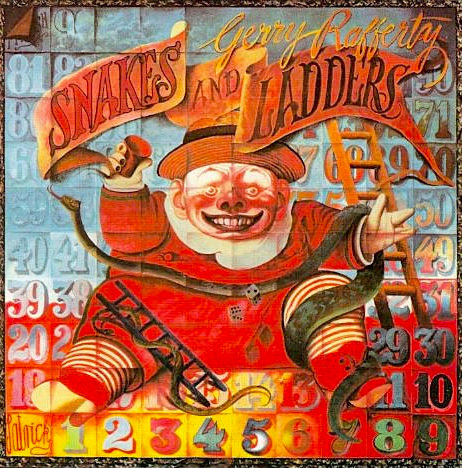 What kind of music did you listen to growing up and what did you like about it? I heard bagpipes, bagpipes and more bagpipes! The bit I loved best about it was seeing my dad playing and competing etc. I really loved the drums in the local pipe band though and that’s probably where my early feel for percussion and beats started. When I got into my teens I listened to everything from rock, blues, classical etc. I was also exposed to the commercial end of the Gaelic music scene and attended Runrig concerts as a youngster. I remember being really into them when I was still in primary school and singing along with their Gaelic material. 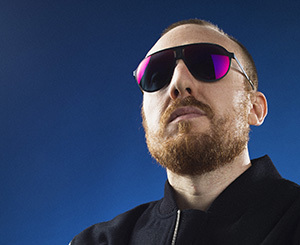 What or who inspired you to start rapping – and did you always rap in Gaelic? My biggest influence as a rapper when it comes to Gaelic material is unquestionably the late Calum Eardsaidh Chonnich (Calum Beaton) from South Uist, where I spent my early twenties. I used to hear him recite line upon line of Gaelic poetry and with the drive in me to become a master of the language and its literature I aspired to be able to do the same. It was only when I had mastered some of the poems I heard from him and started reciting them musically without music that I realised the musicological connection between what he was doing and what I heard in the complex meters of some of my favourite MCs like Talib Kweli. When I started rapping it was all old traditional poems I used. Following that (being a Gaelic poet already anyway) I started developing my skills and the prospect of becoming an MC became a reality. Why do you think rap or hip hop music works for Gaelic/Highland themes – what points of contact do you feel with the original African American rappers? In non-colonised West Africa they have the tradition of the griot who, at one time, as well as being a musician and poet, would be able to recite people’s ancestry to them and tell stories, sing songs of someone’s forebears to give them a sense of ‘dùthchas’. In the writing down of our traditions our filidh, bàird, griot or whatever you want to call them lost their place in society and this coupled with Britain’s dismantling of our traditional communities killed off our very own tradition of Gaelic rap which has existed for thousands of years. There’s nothing new about what I’m doing, only that I have set the poetry to contemporary sounds and beats using a turntable and a sampler or working with African drummers/singers for these sounds as opposed to the guitars, mandolins, keyboards of western folk music it usually meets. 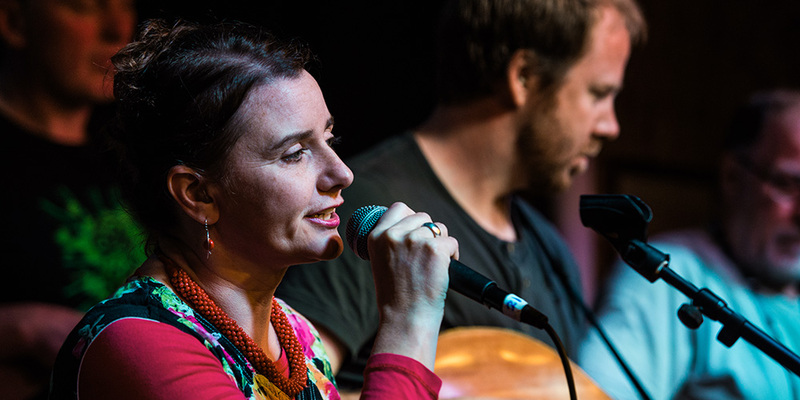 The difference being when it meets those instruments in a folk context it usually changes the nature of the music to be more Westernised; rap brings the poetry straight back to its roots. Most of the melodies and styles of ‘sean-nós’ we have are relatively new when compared with the recitative styles I encountered when studying the performances of our most ancient music; the aural poetry of Oisinn and other greats. When I refer to the poetry of Oisinn I do not mean the reshaped invented traditions associated with James MacPherson, but the thousands of lines of aural poetry which were collected in Scotland that we believe to be the actual words of the ancient poet himself. As far as points of contact with Hip Hop culture are concerned, the first point I’ll make is that Hip Hop is not a culture. It is a civilisation! It’s about self respect, peace, love, unity and having fun. Its roots are ancient and go beyond what the big record companies and the media have led us to believe it is. Like Gaelic culture it has been highjacked and had its true spirit taken out. The people who celebrate both cultures are colonised and have been for centuries. The parallels between what has happened to all the exploited peoples of the world have already made an appearance in Hip Hop. It’s only the racists that believe Hip Hop should be for blacks only. It is a truly global culture and has instilled confidence in, I’m sure, millions of culturally disillusioned people like myself to move their culture into the modern era. It is a truly global phenomenon. It has it’s roots, but they go back a lot further than the ghettos of NY in the 1980s; it goes back to Mac Mhaighstir Alasdair, Duncan Ban Macintyre – to all the great poets of history, musicians, dancers, artists of the world who have expressed a collective consciousness for their people the world over. 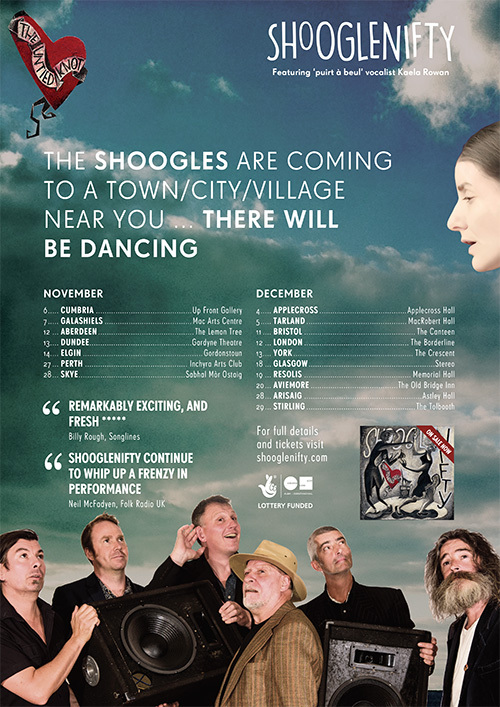 When did you first hear Shooglenifty’s music, and, assuming you are a fan(! ), what do you like about it? Any favourite tunes and why? The truth is that I didn’t listen to any trad fusion music at all until very recently. Whilst exploring my own tradition I was obsessed with ‘the pure drop’ as they say in Ireland and the material I enjoyed listening to was all unaccompanied, old style music! I remember explaining that to Angus [Grant] the night of Knockengorroch and how I really wasn’t familiar with their material at all for that reason! I had performed with his father and spoken about old tunes, but never with himself. I particularly like Angus Senior’s version of my grampa’s cousin Willie’s tune Mrs MacDonald of Dunach and I hope to get it from him some day! It’s only recently, having had something of a revolution of the mind in my approach to tradition that I have opened up to listening to Shooglies, Treach etc, and appreciating the amazing creativity of others of who have found a way of blending tradition and the new in their own unique way. 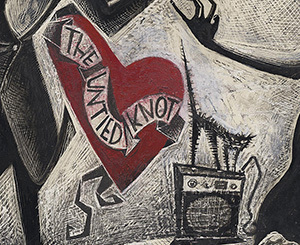 I’m glad I came at it this way though, because it gives me a deeper understanding of how what I’m hearing came together and I must say, having gone through the back catalogue on Spotify I think The Untied Knot is my favourite! James [Mackintosh]’s drumming in particular is completely immaculate and I count him as one of the very best drummers in the country (a really rare thing indeed). The grooves he provides and the tempos etc. are always spot on. When did you first appear live with Shooglenifty and how did that feel? How did it work fusing what you do with the Shoogle tunes? When I met the boys backstage at Knockengorroch this year I had no idea that they would be up for having me on stage, I think it is testament to how keen the guys are to encourage the up and coming (if indeed that is what I am!). I remember standing and listening from the side of the stage with my pal Joe Peat who was doing the monitors and being blown away by the audience’s reaction (mainly made up of people you wouldn’t associate with traditional music). It showed how the guys are kind of ‘genre-less’. Acid Croft is surely about as close as you could get to it! When I finally got the signal from James that my spot was coming up I got a huge rush of energy. It was the first time I’d ever performed on a stage that size and I must admit, I got a hell of a buzz out of it! As far as the fusion goes, I think it worked very well considering we had never tried it before and I hope in the future that there will be more collaborative opportunities! What did it mean to win your recent award at Na Trads (Griogair won ‘Best Gaelic Singer’ at the recent traditional music awards in Dundee)? Winning the Trads meant a lot to me because it made me feel like I’m a part of the bigger picture of all these wonderful musicians and great minds who are currently creating so much beautiful music in this amazing little country of ours. Just to be a part of that and to be considered worthy of being nominated, never mind winning the award was a real honour. What can people expect at the Glasgow gig? 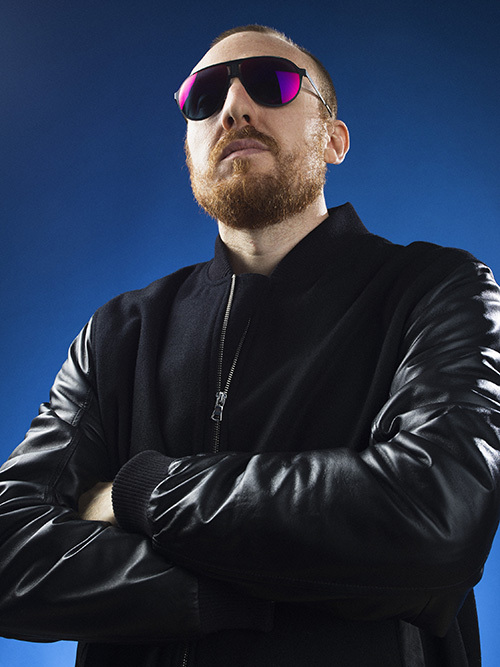 How can you encourage people who might be put off by the “Gaelic rapper” tag? At the Glasgow gig expect to hear REAL HIP HOP combined with REAL GAELIC MUSIC. That is what we intend to bring to the table every time. 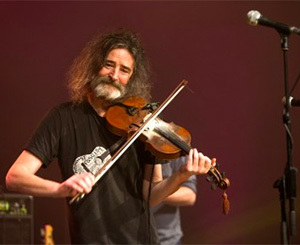 It’s the realness of getting up there and saying it like it is (or like you think it is), cutting and scratching sounds that blend naturally from the african American tradition with the raw energy of Gaelic music (not just poetry, but piping, fiddling and singing) that is the GhettoCroft signature sound. If people are expecting to turn up and be shouted at in Gaelic, they’re in for a surprise! This is something you have never heard before. We also have English language material that people can participate in and understand so the non Gaelic speakers won’t be alienated and maybe, just maybe, a little door into the world of the bàrd/Gaelic MC will be opened up to those who are open to it. There is a deep spiritual element to the kind of Hip Hop we are into anyway and this is reflected in our material. The kind of African American Hip Hop we listen to is all about picking yourself up out of the ‘Ghetto mentality’ and raising your consciousness to create a better you and a better planet. In a disenfranchised, colonised highlands/Scotland where we have our own struggle for freedom many people (although they maybe don’t admit it) feel a strong sense of disillusion and frustration at what is happening politically. We’re here to remind people that they are somebody. That they can and will make a difference in building themselves, their nation and their culture for the generations of Gaels and Scots yet to come. 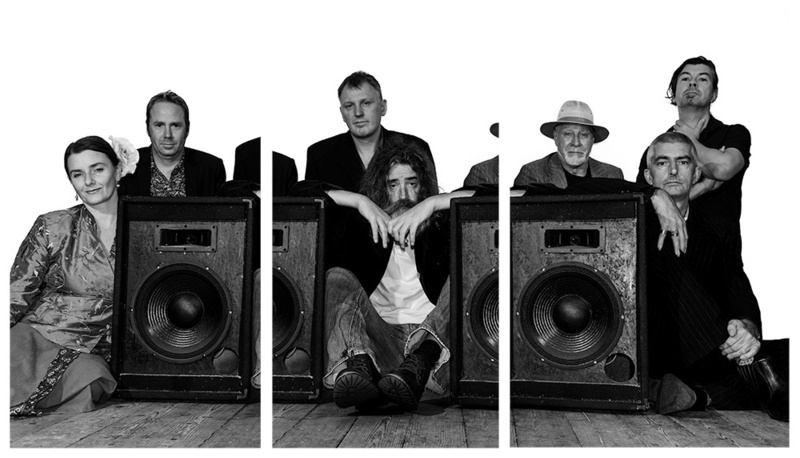 My immediate future plans are centred around the release of the highly anticipated Afro Celt Sound System‘s The Source, which is due for release next year. Thanks to my man James Mackintosh, I got quite heavily involved in the album and went on to become a full blown member of the band. With that in mind the tours, festivals, etc. 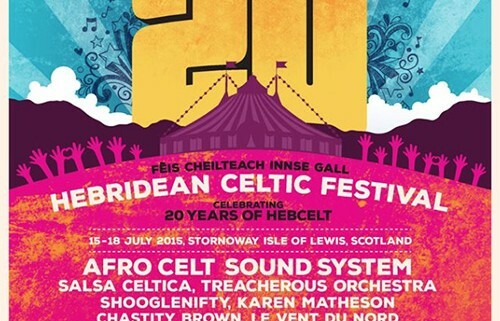 I will be undertaking with my new found kindred spirits in Afro Celt Sound System will take up much of my time and creative energy. Gaelic Hip Hop will certainly not be taking a back seat and, indeed, I see the two projects as being very much part of the same thing both ideologically and musically! And we’re offering two gig tickets to the person who puts it in the most outlandish location. The lucky winner can make their choice of gig from The United Knot tour. So send a pic of the poster in its location to shoogle@shooglenifty.com by 2 November 2015. The winner will be announced on 3 November 2015. 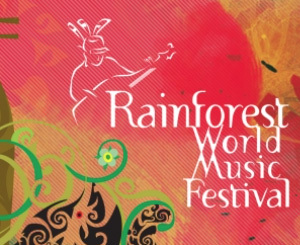 This time next week (7/8/15) the Shoogles will be enjoying their fourth trip to the Rainforest World Music Festival (RWMF) in Borneo. This is a music festival, that, as the name suggests, happens in the jungle. 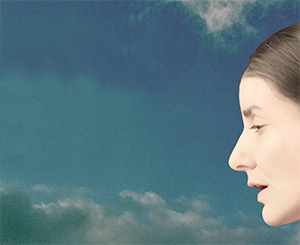 It’s hot, sweaty and full of amazing sounds – musical and otherwise. Unsurprisingly the band are relishing the opportunity to entertain in the Rainforest once again, and new band member Ewan MacPherson is particularly keen to visit the orangutans that are native to Borneo. “Hopefully he won’t get lost like Conrad [Ivitsky] did on one of those first trips,” says James Mackintosh. Jun Lin Yeoh is in no doubt: “the Rainforest audience loved them the first year they came. 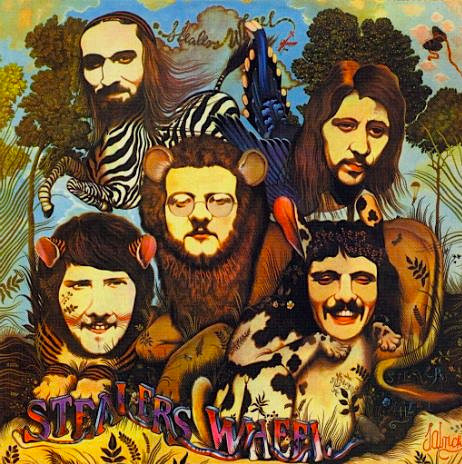 They all looked mighty fierce and badass, but were really gentle giants, and their music rocked.” For those of us used to midgies, that sounds a bit like the wildlife. The Rainforest Music Festival is held each August in Sarawak, Borneo. 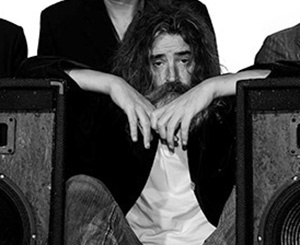 Shooglenifty will headline the festival’s Jungle Stage for the fourth time on Friday 7 August 2015. John Byrne has quietly become a national treasure over the past couple of decades. 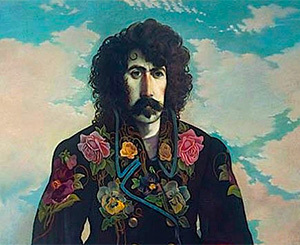 Arguably Scotland’s greatest living artist: he recently had a major retrospective at the National Portrait Gallery and several of his portraits are included in the gallery’s permanent collection. He is also well known as a writer of plays, films, and TV series (Tutti Frutti anyone?). One of his best known works, The Slab Boys, has just completed a sell-out revival at Edinburgh’s King’s Theatre. 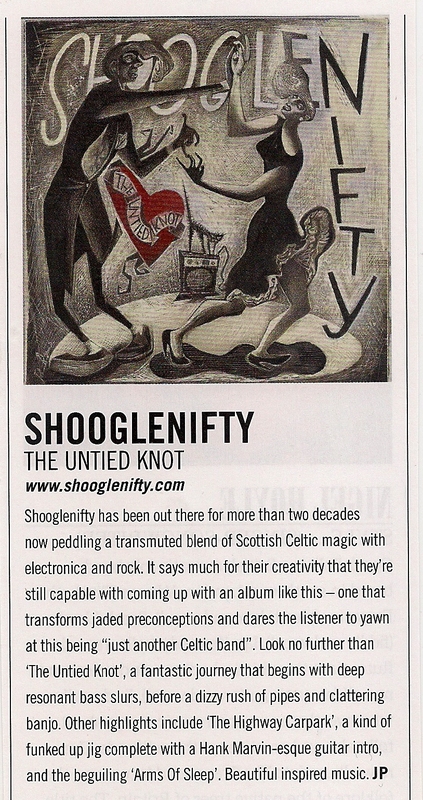 Given such a stellar career you might wonder how we persuaded him to design the cover of Shooglenifty’s new album. 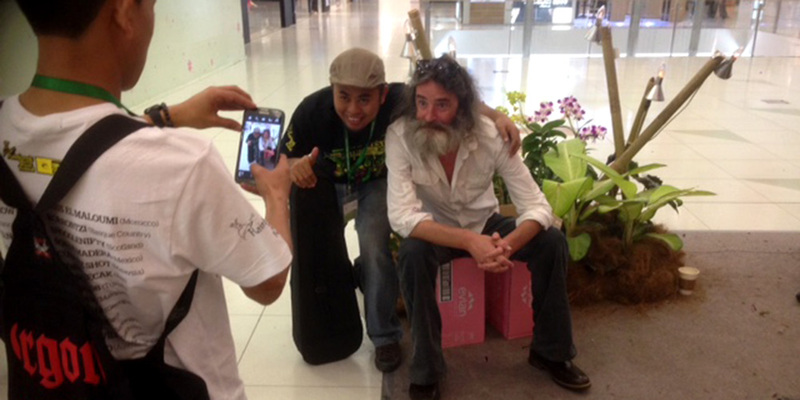 It’s a simple story, the band bumped into him at a gig and, as a fan, he offered his services. Despite James losing his number not once but twice, the brief was (finally) despatched and the great man duly delivered (some months before the band as it turns out). 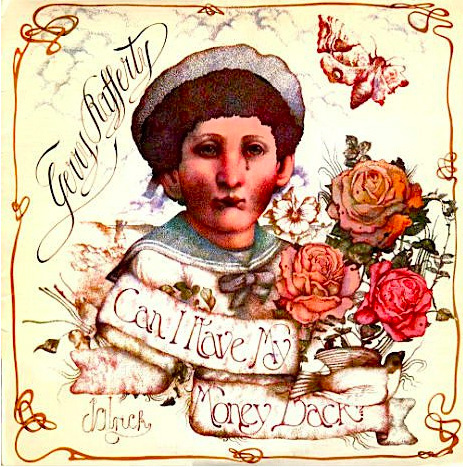 Getting Byrne to design the cover for The Untied Knot saw him continue a long love affair with music. 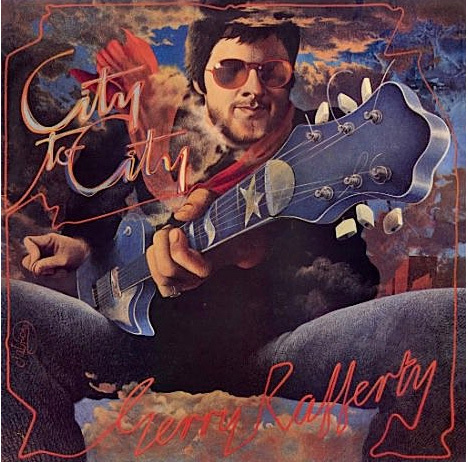 In the 1960s and 70s he designed covers for folk luminaries Stealer’s Wheel, Gerry Rafferty, Billy Connolly, and Donovan. A less well-known commission was received from The Beatles in 1968, for the album that was to become The White Album. 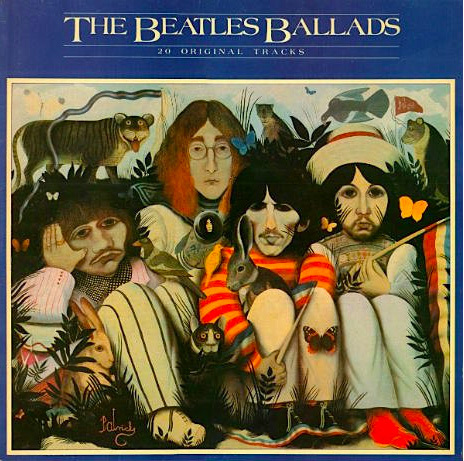 Byrne’s design wasn’t used, but reappeared in 1980 as the cover for The Beatles’ Ballads compilation. To see The Untied Knot’s cover join this illustrious list is big deal for the Shoogles (all fans of Byrne’s work) and we’re looking forward to sharing it with you when the album is released at our special 25th Anniversary Concert and CD launch at La Belle Angele, Edinburgh on Saturday 16 May. We hope you will join us, and pick up your own copy. Tickets are on sale here. No body can put an exact date to the day that Shooglenifty was born. The year, however, is not in doubt. In 1990 Angus R Grant, a rebellious highland fiddler, Malcolm Crosbie, a guitarist who got his start in a semi-glam New Wave combo, and James Mackintosh, a drummer with groove going spare went busking in Spain. The trio experimented with the traditional tunes Angus had known since knee-high to a fiddle stand, and twisted them into the germ of something new and exciting. 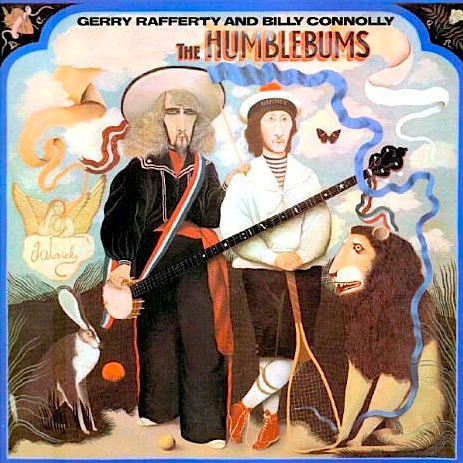 When they returned to Edinburgh they added banjo, bass and mandolin to the mix and that germ began to grow. The band rehearsed like mad, and played in pubs around the city until Martin Coull, the manager of the newest club in town, La Belle Angele asked them if they’d like to play his joint. “The first gig at La Belle was six punters and an electric bar fire,” remembers Malcolm. “It was the middle of winter and we just huddled round the centre of the floor.” It was perhaps an inauspicious start, but having great faith in the band, Martin turned this one off gig into a residency, the Shoogles built their audience, and by the end of the year it was an essential weekly event for progressive folkies and energetic dance fans alike. Check out the poster above, a remnant from that time, by original Shoogle bass player Conrad Ivitsky Molleson. 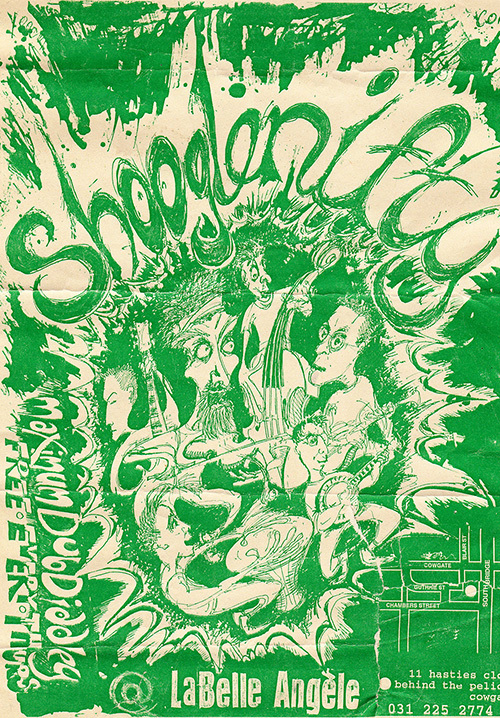 It would not be unfair to say that the Shoogle sound evolved in La Belle, and many of the band’s early fans have fond memories of that time. 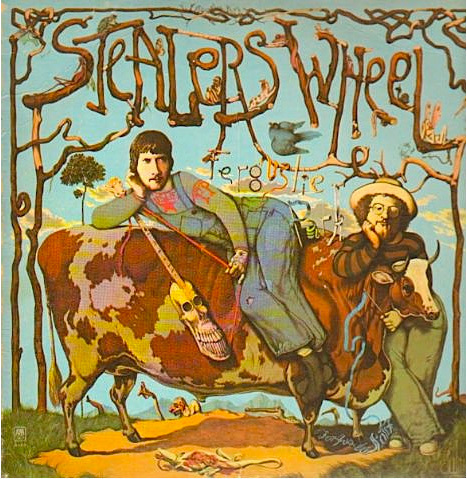 The residency led to the band’s first album, Venus in Tweeds, and the launching of the Shoogles onto the international scene. 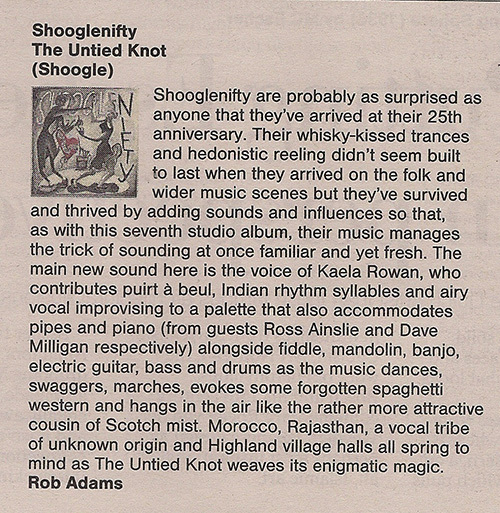 Since then Shooglenifty has entertained audiences from a few hundred in highland village halls to tens of thousands in festival fields. Back home in Edinburgh La Belle Angele became one of the city’s hippest haunts, but sadly burned to the ground in the fire of 2002. Fast forward to 2015, and La Belle Angele lives again in its original location of Hasties Close, just off the Cowgate, (after a very long wait it finally reopened in November 2014). Shooglenifty is celebrating 25 years and where better to have the biggest, banging party to celebrate that milestone, but the club that launched them on their way. 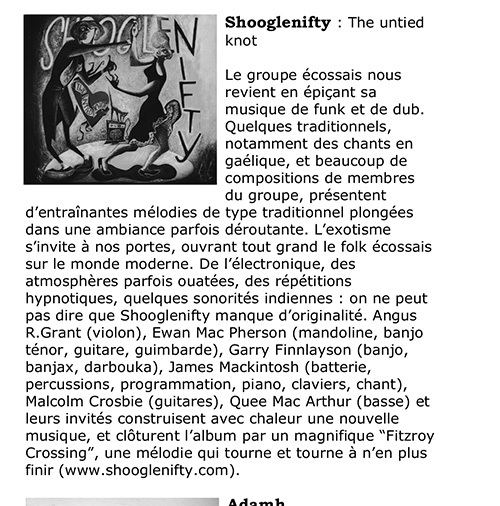 Shooglenifty’s 25th Anniversary Party and CD Launch is at La Belle Angele on Saturday 16 May 2015 at 11pm. Get your tickets here!